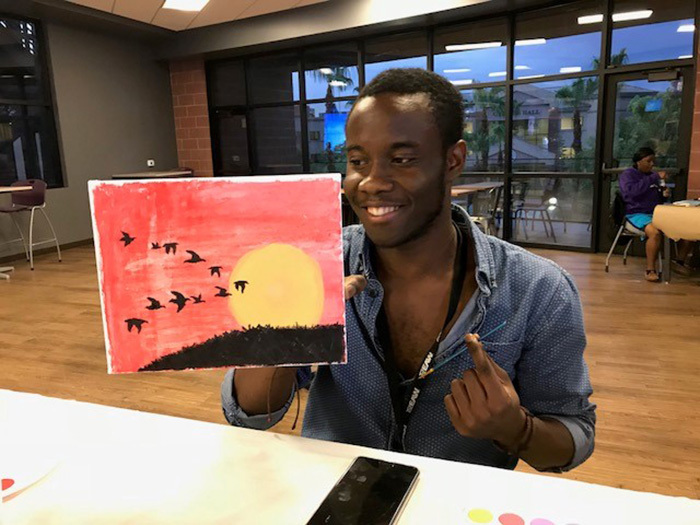 David Akwa, a junior, created a distinctive contrast. Emma Ahern and Amanda Dinger show their creations. 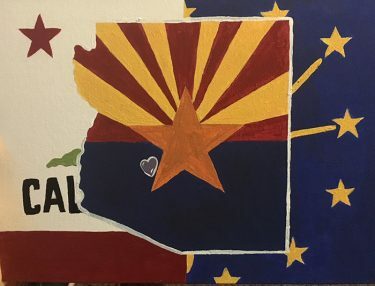 Black birds flying at sunset, a baby blue narwhal, green prickly pear cactus, symbols of Arizona overlaid atop symbols of California – as evidenced by a handful of paintings, inspiration poured down more heavily than the rainstorm outside GCBC last week. 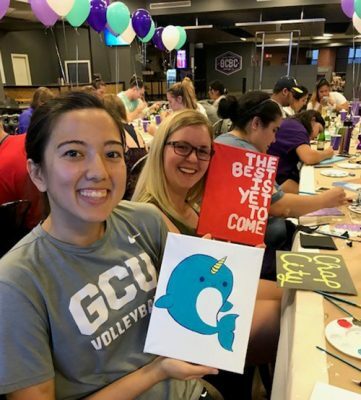 At the first-ever Paint Night, creativity and social connections flourished among Grand Canyon University summer school students. The refreshments were a hit, too. 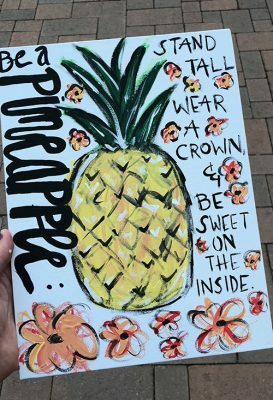 KJ Adams painted a gift for her coach. It was exactly the right place, proving to be the perfect way for Adams to experience the welcoming, friendly atmosphere that defines Lopes spirit. Adams, who will start her freshman year in August, came to campus early from her hometown of Houston to take one summer school class, work a youth volleyball camp and participate in voluntary volleyball drills before the start of official practice next month. Her teammate, Kayla Redfield, a junior setter from Highland, Calif., found her artistic muse thanks to the variety of tools at her disposal. 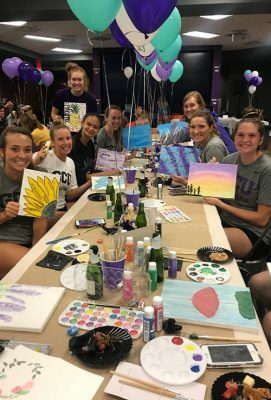 From left, Kaira Moss, Emma Ahern, Meme Fletcher, Molly Feldmeth, Kayla Redfield, Tressa Schuler and Maria Adams channel creative juices on Paint Night. Including 10 volleyball players, there were approximately 65 students at the event, according to organizer Kayleigh Holton, student activities coordinator of the Canyon Activities Board (CAB). In an effort to cater to summer school students of varied interests, the event was conceived by the CAB staff. Sarah Hagge, a sophomore from Northridge, Calif., painted Arizona’s logo over the one from her home state. Caleb Palmen, a junior from Spokane, Wash., painted an evergreen tree scene, as a reminder of his hometown. Typically, Palmen does not paint.